Customer goals & opinions of dredging site, materials, volumes, TDHs. SRS Crisafulli. 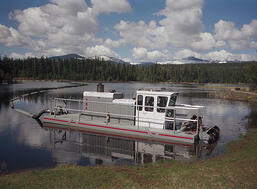 Do you need a dredge now, or have an upcoming job? Our application engineers will work with you to determine the best solution for your unique requirements. SRS Crisafulli specializes in custom designs to meet the toughest dredge challenges. The dredge application provides us with the necessary information about your requirements so we can provide the right solution for you. All you need to do is complete the request form. You can download a copy to your right which you can complete at your leisure or fill out the form provided below. After we receive your application, one of our engineers will be in contact with you soon.